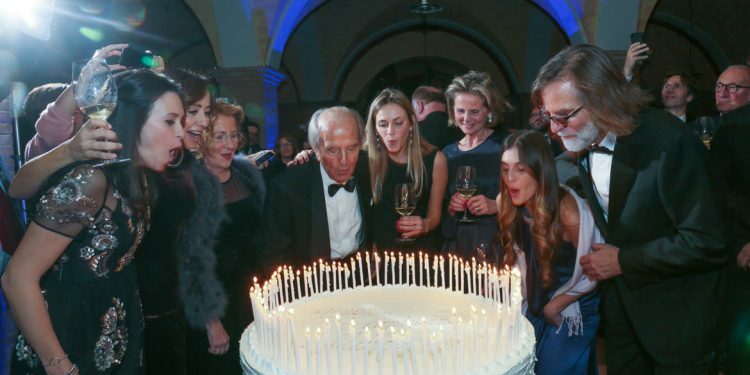 “Ninety years have just flown by,” says Marco Felluga in a resolute tone without a hint of emotion before 150 guests who gathered together at the end of October in the striking Russiz Superiore ageing cellar, in Capriva del Friuli, to celebrate his “first” 90 years. He is a pragmatic man, very demanding at work and his great intelligence is backed up by uncommon intuition and vast culture. Felluga has not just dedicated his life as a producer to his own wineries, but also to the common cause of the territory. In fact, he has been president of the Consorzio Collio twice. Some have defined the path his life and work have followed as “a story of intuitions”, because Marco Felluga is without a doubt one of the patriarchs of Friulian winemaking. He is the fourth generation of a family working in wine and a prominent figure in the Gorizia area of Collio. He has worked hard to improve both the quality of wines from this area and to promote them on world markets. In addition to the gala dinner, this important anniversary is being celebrated with a book and a wine that his son Roberto has dedicated to him: the Collio Bianco Gran Selezione 50/90. The wine contains all the experience, passion and creativity of Marco Felluga’s wineries and Russiz Superiore, together with the values Marco has handed down to Roberto. It will be a while longer before connoisseurs can taste it, since the DOCG Collio will only come into being with the 2018 vintage. 50/90 is a book written by Walter Filiputti (with images by Tiziano Scaffai) that narrates, on the one hand, Marco Felluga’s story (he is in great shape at 90 years old) and the history of Collio, a territory that he helped to promote by dedicating his professional life to wine. On the other hand, it tells of the 50 years that the whole family has come through and dedicated to Russiz Superiore, their masterpiece. Today, his son Roberto Felluga (fifth generation of this dynasty of vinegrowers originally from Istria, who came to Friuli Venezia Giulia in the 1920s) is carrying forward this work and will, in turn, pass on this knowledge and dedication to his daughter, Ilaria. His sister Patrizia looks after the Zuani winery (Collio), while Alessandra works between Castello di Buttrio (Colli Orientali del Friuli) and the Tuscan winery San Nicolò a Pisignano (San Casciano Val di Pesa).